Redfish fly patterns have flourished of late just as the fishery itself has continued to grow and grow. This powerful gamefish is just made for an 8 weight fly rod resulting in its growth in popularity. Brown and down was once the design criteria for redfish patterns meaning weighted patterns of brown color schemes. This is no longer the case. Although brown is still a dominate color scheme for redfish patterns you will now find a wide range of color combinations dictated in many pattern recipes. There is also a good degree of synthetic reflective material used in pattern design to compensate for the often stained water that redfish inhabit. 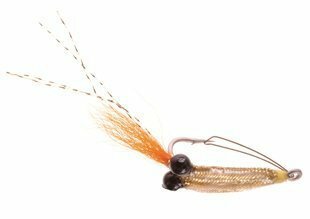 Rattles are also commonplace in baitfish patterns again to compensate for water clarity. Spoon flies as pictured here (Caves Wobbler by Jon Cave) are also somewhat unique to this fishery. Bright flashing colors of gold and silver are predominate in these very effective patterns. Weed guards are also a necessary component due to the often weedy environment of the redfish.